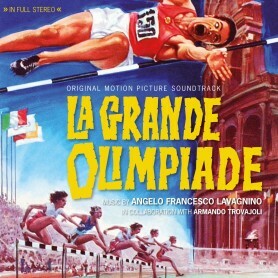 Alhambra Records is proud to present on this CD the world premiere release in stereo of Angelo Francesco Lavagnino’ absolutely brilliant symphonic score for the 1960 feature-length documentary LA GRANDE OLIMPIADE (THE GRAND OLYMPICS) about the XVII Olympics in Rome which was directed by Romolo Marcellini and released in Italian cinemas in early January 1961. It even got nominated for an Oscar as “Best Documentary Feature” in 1962. Some jazzy parts of the score had also been composed by Lavagnino’s colleague and friend Armando Trovajoli (for example a “Mambo” which is very reminiscent of his famous “Mambo Bacan”) and have been included as bonus tracks at the end of our CD. This wonderful CD project – the sixth CD in our Lavagnino series - has only been possible thanks to the generous support of the three daughters of the composer - Bianca, Iudica and Alessandra Lavagnino -, who still had all the open reel tape copies in stereo of the original mastertapes in their personal archive. 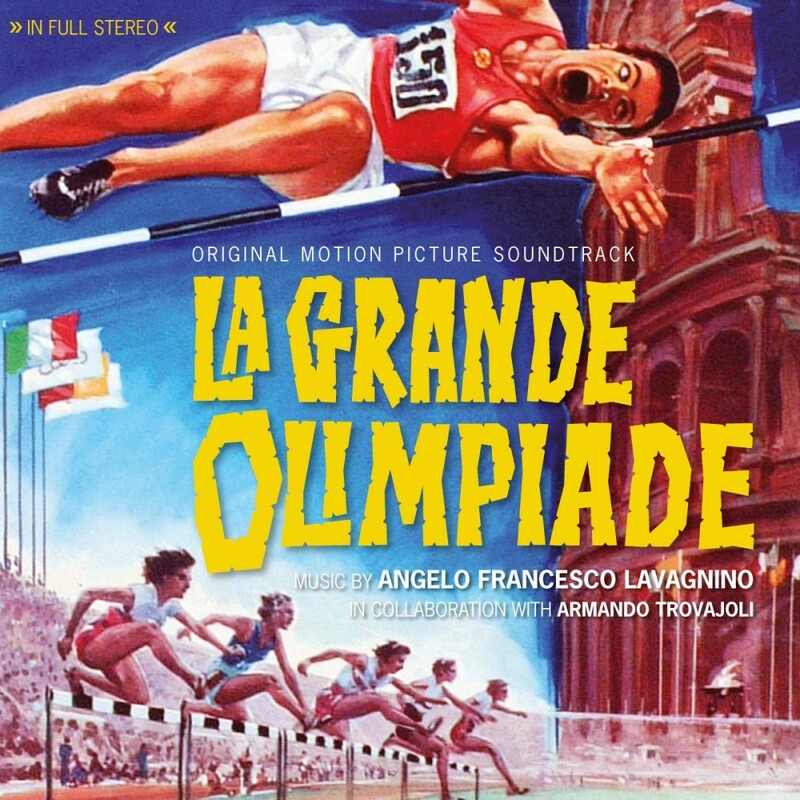 We have opted to put together in a chronological sequencing all the symphonic tracks by Lavagnino for LA GRANDE OLIMPIADE which make musical sense and which amount to an impressive duration of about 65 minutes. In these tracks Lavagnino can be heard at the peak of his creativity in providing a variety of really sumptuous and lush themes and colourful orchestrations with a quite distinctive use of the wordless female choir. 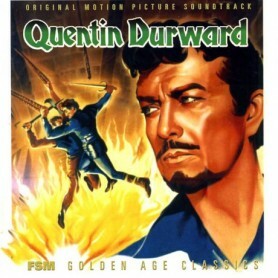 Listened to in its entirety, the score forms a fascinating large-scale symphonic poem. 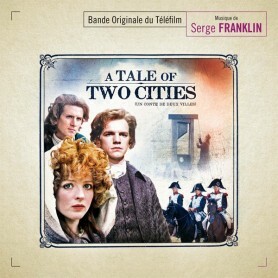 The Main Title introduces the sweeping long-lined main theme which is one of Lavagnino’s finest melodic inventions and shows the enthusiasm he had for this project. Typical of Lavagnino’s style, the wordless female choir – by the way, it is remarkable that no male choir at all has been used for LA GRANDE OLIMPIADE –, the harp glissandi and of course also the high strings play an essential part throughout this score and often give it a mellow tone as well as a sensual sheen. Often the choIr adds an almost mystical, poetic atmosphere to the sports events. One delightful theme after another crops up in this score: There is an impassioned and operatic theme for the torch relay montage, a spirited hunting music, nostalgic music for the sailing regatta, a lilting and totally ear-carching melody for a Sunday in Rome sequence whistled by Lavagnino himself, a noble trumpet hymn for the decathlon ceremony and much, much more. All in all, this will therefore be a musical festival for all the aficionados of the composer. 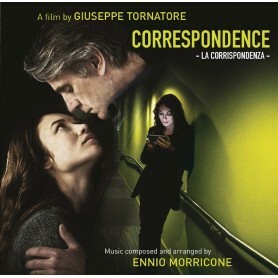 An absolute delight from start to finish and one of the best scores Lavagnino had ever composed during his long career. Some older collectors who have the now quite rare Cinevox LP in mono of Lavagnino’s VATICANO II will probably recognize some tracks as about 25 minutes of the GRANDE OLIMPIADE score had been reused for this Italian documentary in 1963, but there is still more than half of the entire GRANDE OLIMPIADE score which has never been available on any sound carrier before and which can now be heard for the first rime ever on this CD. legend Armin Hary who won two gold medals at the 1960 Olympics in Rome.